Ridgefield Kayak took a new trip today and I was there with them. It was beautiful paddling from Skamokawa, WA to Cathlamet, WA - a total of about 7 miles. The original plan was to end at Skamokawa, but the weather prediction, along with tides and all those things the guides check, indicated some strong winds that would make it better to start at Skamokawa. The trip was really nice. We went through sloughs, on rivers, a little bit on the Columbia river. 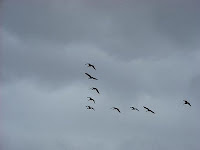 We saw osprey, eagles, terns (I forget which kind), gulls (of course), Canadian geese, killdeer, purple martins, blue heron, a small young ill/malnourished coyote, river otter, neutria, and probably more that I either forgot or didn't hear what they were called. We paddled through steep banks where animals surely lived, along the edge of swamps, past abandoned waterfront property and some which weren't abandoned but looked nearly the same. We saw old piers where the plants are now growing out of the top, natural Ikebana which was incredibly gorgeous, one place that I named the "ghost forest" because of pier-like tree trunks sticking out the water, all the same height, in front of a forest bank. I didn't take very many pictures, because I was busy paddling. And I was still getting used to a new style of hardshell kayak. It was a little nervewracking for a few minutes when we first went on the Columbia river portion, because there were little waves and wakes, as well as more wind. I felt pretty comfortable in the more snug fitting boat up until that point - so much so that I even attached my spray skirt (which means I wasn't afraid of falling in the water and not being able to get out of the boat because of the skirt) - but the choppiness and the wind were much more rocky. After a bit I adapted - and will admit to being glad the Columbia portion was fairly short. Next time it will be easier. One paddler had been called in to work, so it ended up being three guides and three guests. Not bad odds! Everyone was a delight and it was a great day. 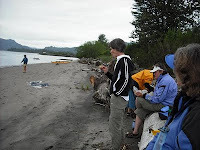 This short video is at our lunch stop at a sandy beach along the Columbia river.